What am I currently knitting? 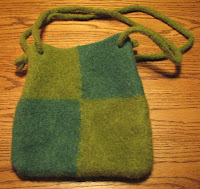 I just finished this adorable felted bag for a swap partner (you make a bag and fill it with goodies for your partner), it's from the Vogue "On The Go" Felting book I received from my SP11 partner (thanks!). It's meant to be done in four different colors. But my partner really likes green so I thought I'd do it with two greens. I may make this again -- it's very cute and easy. And what's on the needles? [Not including old UFOs*].... the grown-up version of the Harry Potter baby hat I keep promising to Tommy (better get it done while the weather is still cold) and some quick wristlets/fingerless gloves for another swap package. Love the bag! I'm sure your swap partner will adore it! Thanks so much! It was a cute quick pattern. Great bag! It's in my personal project queue, and it's such an easy knit. Now that I see it in action, maybe I'll actually feel motivated to follow through. Thanks for the quick-knit inspiration!